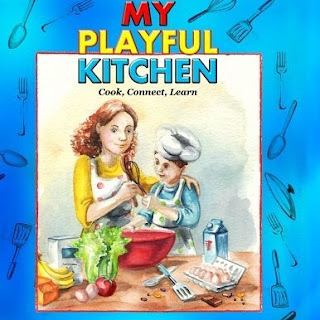 As a young girl, I always watched my parents cook. Back then, people actually ate dinner together and our parents knew how to cook. I have noticed over the years that cooking is a dying art. For some reason parents stopped teaching or the kids were only interested with being served. Either way, it is a shame. My Playful Kitchen can really help with that. 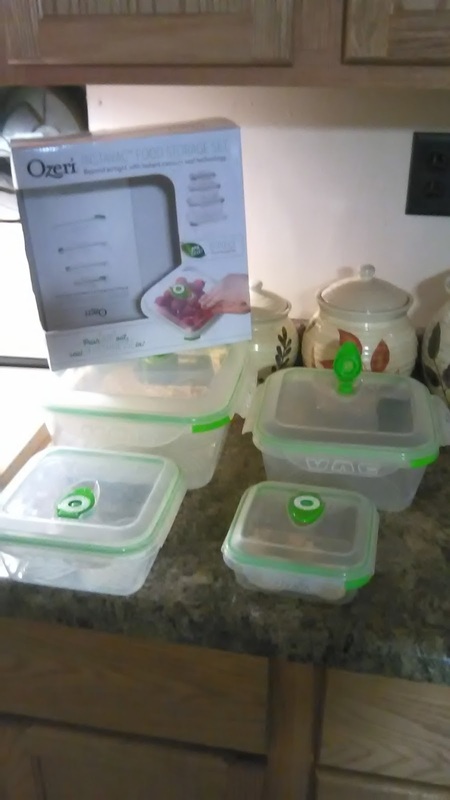 It not only gives recipes, but it also visually prepares them for what they are about to do. My kids and I had a lot of fun cooking together with recipes that were possible for them to figure out. I think the author did a great job. 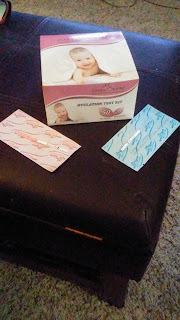 I was young when I had kids and had my tubes tied. I regret it now, I never stop trying though. 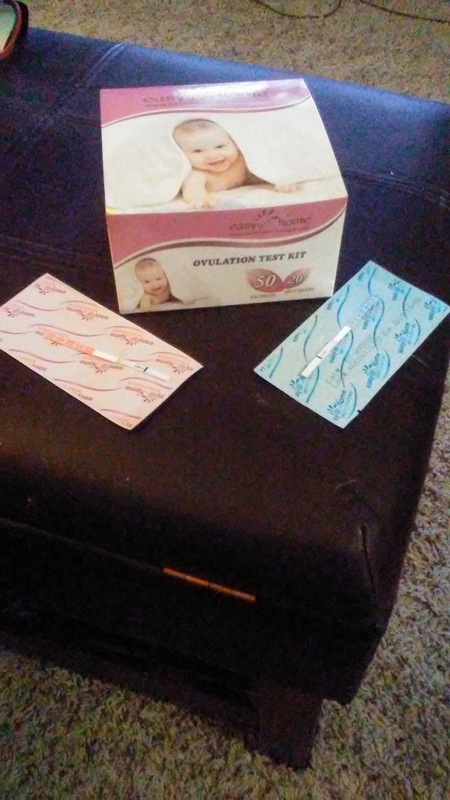 These ovulation tests are really helping with timing. I tried a few, just to make sure I get the same results, and they all worked correctly. I love that they are easy to read. All I do is potty in a cup and hold a stick in there for a few seconds. You get results quickly. They aren't big and bulky and are easy to hold. 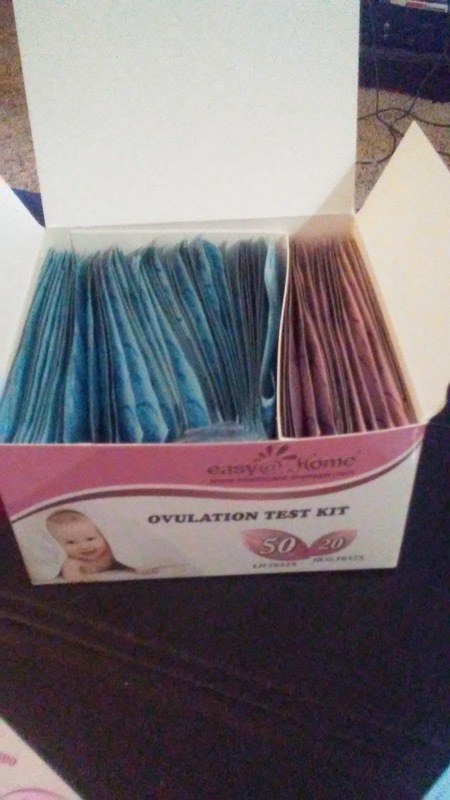 I received this product at a discount in exchange for my honest opinion. The last few years have been hard on my weight. I was so use to being skinny that I went into a kind of denial and just stopped looking in the mirror. It is easy to blame the medicines that I got put on, 14 in all. At the end of the day though, the blame has to go on me. I was still eating what I wanted to when I wanted to. Every year I go through the same things, I get depressed and start working out for a few weeks until it just stops again. This time though, I am sticking to it. Next week will be a month that I started to change my life and I really want to keep going! I am not a diet expert obviously but I am doing it my way. Slowly, but my way. First I took a month to get use to drinking water. I hate it, but I have to have it. Now I make sure to drink half my body weight or more in water. 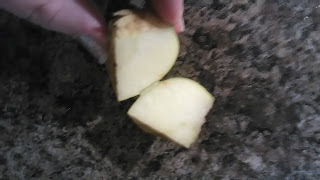 I have cut the pops down from 5 or 6 to one or two a day. i'm pretty proud of that. After I got that under control, the walking began. Now I try and make sure to get my 10,000 steps in. That is not the easiest thing in the world to do. We don't have a car and we live in Indiana, so getting outside isn't the easiest thing to do. I have learned to adapt though and made a path through our home to walk in. Next month I am going to add a workout into my routine as well. Through all this, my shaper has been a good friend. I wear iit when I work out to help me sweat more, plus seeing a skinnier me in the mirror helps as well. I hope to be about 50 pounds down by June. I am doing this for me, but there is no reason I can't show off my revenge body. Tips are needed though. So far the only other thing I have changed is my diet. We never ate breakfast before this, but now I do. Oatmeal and toast in the morning and a healthy choice meal and veggie for lunch. Dinner is the norm, I just make sure to eat a lot less and use my portion control containers. Other then all of this, does anyone have other tips for me? I am very serious about this, it is past time for me to be able to look in the mirror and see someone worth looking at! Let me know below. I think it is safe to say, we all remember the very first thing we got for free. I started this journey five years ago and it stays exciting. My husband was in work release and I had trouble finding my way and finding happiness. It seems silly but getting a small sample free in the mail really helped. Sampling is a great way to get your feet wet. Most samples just require you to fill out a short form with your address and name. In a few weeks, whatever it is will show up at your home. I had days where I got boxes of stuff and an overflowing mailbox. The thing is though, i kept seeing people getting actual full sized items...for free! They say it is a lot of work, they warn you about it, but when you are on the outside, it doesn't matter. Life seems so much greener on that side. Don't get me wrong, I really love what i do, but you can get lost in this world, swallowed up, if you will. Businesses and even other reviewers can be brutal. If you want into this game, you have to know what you are doing. 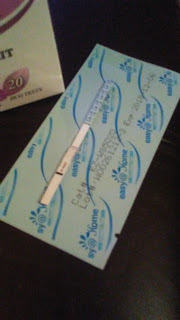 There are many sites I am sure, but I have been faithful to Tomoson.com since I started. They have a few issues, but nothing you can't overcome. The main problem is Amazon. They have a bit of a monopoly over the review game, but companies took the blow like champs and found other ways for us to help them. 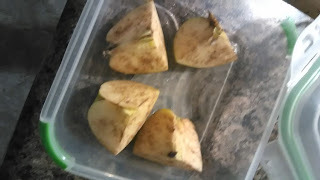 One major thing you should have if you want to reviiew, is a blog. It seems like a lot of work (and they are) but they really help to get the name out, so businesses can find you. We have a page on pretty much every social media outlet you can think of. Everyday, is promoting this page or that one, reviewing, and stressing about what you could have done better. You can review, just take it slow. You may want to jump in with a new fan or tv, but pay your dues and protect that face with face serums. In a few months, you should be getting some amazing items. Basically, all you have to do is find the right reviewing site, set up and promote yourself and your pages, and the best advice I can give, find someone who has been doing this for years, they can answer any questions you need to know!! Help others out with your tips below! Thanks for reading everyone, have a great day! Bike safety is a huge issue nowadays. I see a lot more people out on bikes, but there are also the people you can't see on the road. 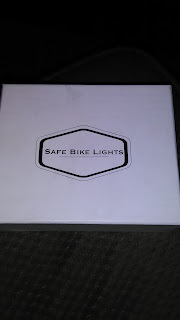 My husband was actually pulled over on his bicycle one day because his lights were at home and he left during the day. Now he doesn't go anywhere on it without having them. Just like everything else, these sets come in all different types and sizes and of course brightness. 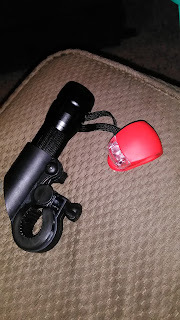 I have reviewed some that are very bright and a few that weren't bright at all. I say that this one fits right in the middle. 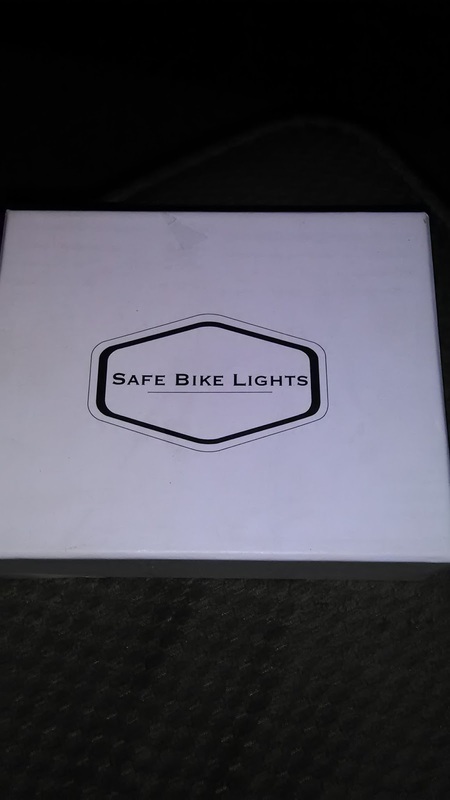 It isn't crazy bright, but you will be seen when you are riding at night. It includes a high, low, and a strobe feature. The tailight also includes a slow strob as well. I like that you can also take the light out and use it as a flashlight if you are out and you need it. The conveinence is nice, many others are just mounted too the mount. Speaking of, this set is so easy to install. The taillight just wraps around the back bar and bands back to itself. 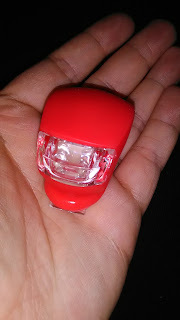 The headlight is just as easy, just unscrew it and then place it around the bar and screw back and you are all set! 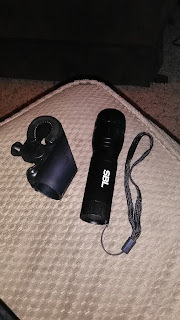 We are pretty happy with this set, the only drawback is the fact that the headlight takes batteries and is not rechargeable. If you get this set, it would be smart to buy a few rechargeable batteries. You can find this great set at Amazon by going here. I did receive this in exchange for my honest review, but everything I said is 100% truthful. Growing up, butter tubs were acceptable food storage containers. It took forever to find the butter at Grandma's. I'm guilty of this as well. I should be more worried about safety, but most of our stuff is still in storage! That being said, this set came at the best time. My first impression of these was impressed. They seem big and bulky but you get use to them. I was immediately impressed with the design though, and how much thought was put into them. I didn't read the full instructions and pumped one too many times on two of them and they cracked on me. 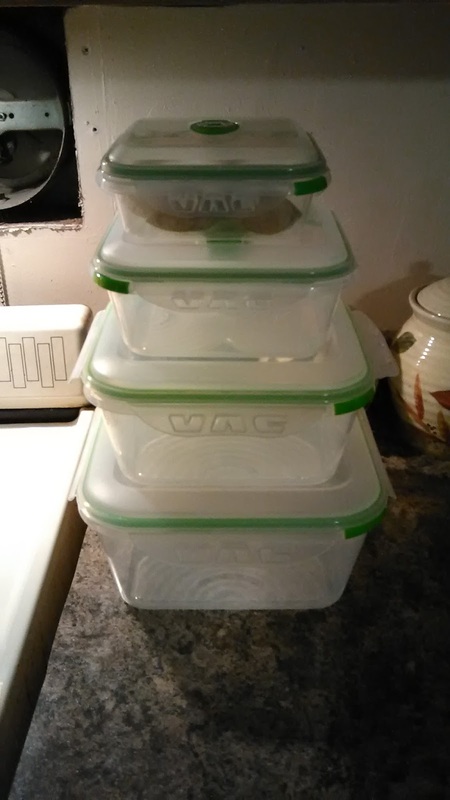 I can still use them, they just won't work as vaccum sealed containers anymore. Make sure you read the instructions thoroughly. Stepping away from my mistake, these containers are really awesome. 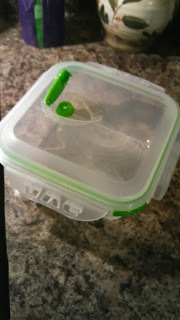 Our meat lasts days longer than they use to in our old containers. Plus they are simple to use. All you do is load them up and snap on the lid. With two fingers, push in until the bubble no longer pops up with each push in. 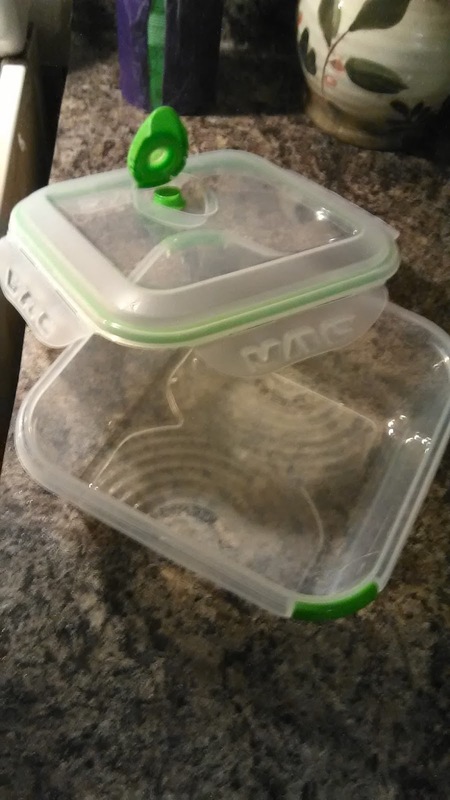 When you open them, lift the flap to let out the air and then take off the lid. I think we have all had those days where we are stressed to the max. I know I do almost every day. 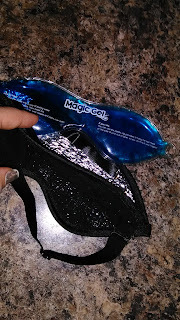 This eye mask from MagicGel has worked wonders for me. 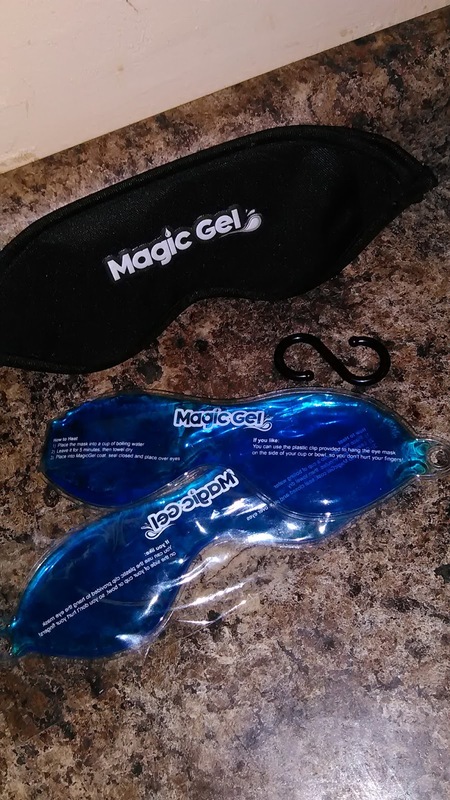 It is a gel pack inside an eye mask. So far I am in love. Here's how to use it. First gather all of your supplies. 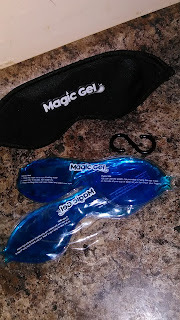 Cup, water, the eye mask, clip, and a gel pack. 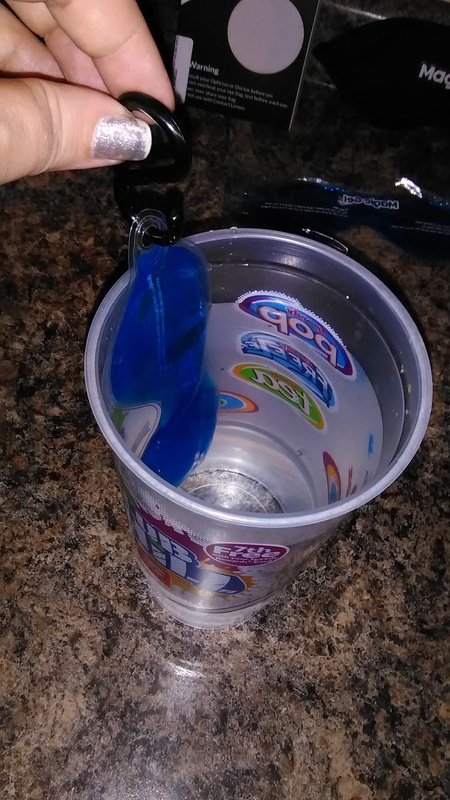 Boil the water and clip a gel pack to the edge. Let it sit for five minutes. 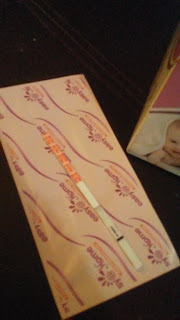 After five minutes, pull out the gel pack and wipe it off. 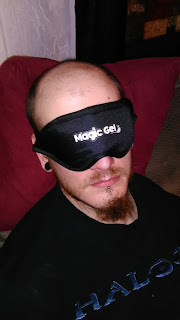 Once dry, put it into the eye mask. From there, sit back and relax for ten minutes. After a long day, even my husband enjoys this eye mask. 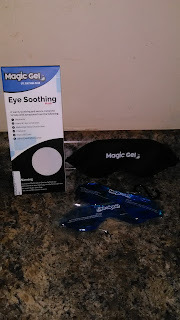 If you are stressed or prone to stys or cysts, you need to check out this mask! 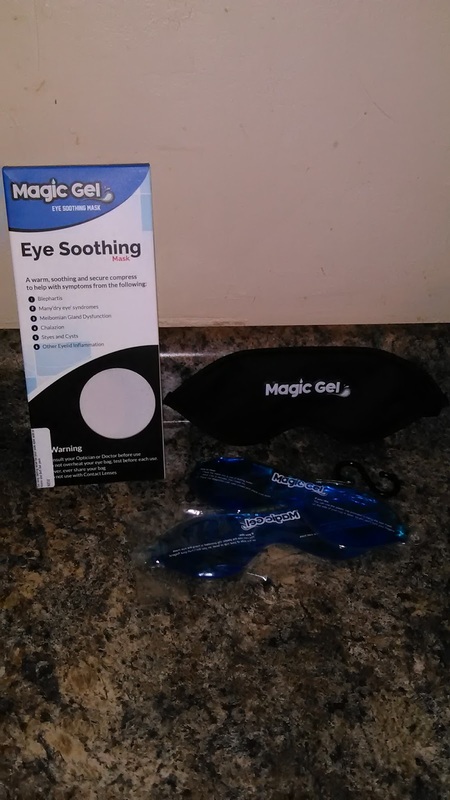 You can check it out at the MagicGel Soothing Eye Mask product page on Amazon. I received this product at a discount in exchange for my honest opinion.